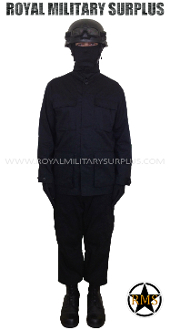 This BLACK (Black Tactical) Tactical SWAT/Military Kit includes the Shirt and Pants in Black (Black Tactical Pattern). It also includes a Black (Black Tactical) MICH TC-2000 Helmet, 1 Adaptative System Balaclava (Black), Tactical Assault Goggles and a pair of Commando Assault Tactical Gloves (Black). All items are brand new and the Shirt and Pants are available in size S-M-L-XL-XXL. In use by Army, Military, Police and Special International Forces.